The potential benefits of a pacemaker include normalized heart rhythm and improved quality of life. Physicians recommend pacemakers for patients in varying degrees of cardiac distress, so the potential benefits of a pacemaker will vary, as well. 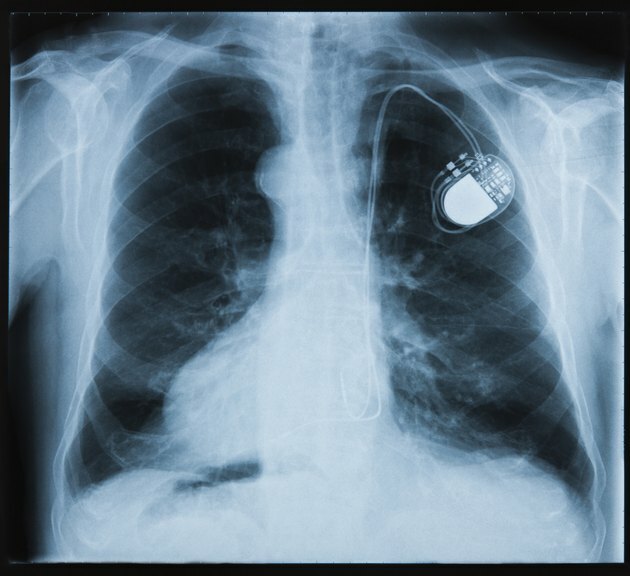 Pacemakers are tiny electronic devices that are surgically implanted inside the upper chest. A pacemaker’s primary purpose is to monitor heart function and, if necessary, produce an electrical signal, transmit that signal to the heart, and stabilize an irregular heartbeat. The major benefit provided by a pacemaker is the establishment of normal sinus rhythm, or a normal heartbeat. Pacemakers mimic the heart’s natural sinus rhythm. A pacemaker can determine a patient’s normal, resting heart rate, and ascertain if acceleration in that rate is due to an increase in activity or a pacing problem. If a pacing problem occurs, a pacemaker helps establish atrioventricular synchrony, the normal process of pumping blood by contracting the atria and ventricles, which are chambers of the heart. There are three cardiac conditions for which a physician may advise a pacemaker: tachyarrhythmia, or fast heart beat; bradycardia, or slow heart beat; and arrhythmia, or irregular heart beat. Each of these conditions has the same basic symptoms of dizziness, fainting and shortness of breath, general fatigue and chest pain. A pacemaker may not eliminate all these symptoms, but by stabilizing heart rhythm, many of these symptoms will be alleviated. Pacemakers do improve the quality of life for most patients. In the June 2006 issue of Heart Rhythm, Dr. Kirsten E. Fleischmann examined the effect of pacemaker implantation on the quality of life of over 2000 patients. She wrote that most patients experienced significant improvement in their quality of life post surgery, particularly in the area of improved physical activity. In Dr. Fleischmann’s study, patients under age 75 experienced the best improvement in their quality of life. Biventricular pacemakers are often used for the sickest of patients, those experiencing heart failure. A pacemaker coupled with an implantable cardioverter-defibrillator, also called an ICD, is a powerful lifesaving combination. The electrical impulse generated by an ICD is more powerful than that provided by a pacemaker. Together, they can prevent a patient’s sudden death by sending an electric shock to the heart when an abnormal heart rhythm is sensed. In the June 2007 issue of the "Journal of the American Medical Association," Dr. Finlay A. McAlister wrote that pacemakers reduced hospitalizations by 37 percent and reduced mortality, or death rates, by 22 percent. Are There Any Risks Associated With Alcohol Use for Someone with a Pacemaker? What Are the Treatments for a Supraspinatus Tendon?